Sustainability Modeling and three stages of life: childhood, adolescence, and adulthood. What do a weir financed by FMO in Honduras, an oil pipeline financed by ING and ABN AMRO in the US, and the ban on financing gun producers have in common? Banks, of course. Banking is often thought of as a formal and rigid business, but in fact, it is a constantly changing one. In the last decades in particular we have witnessed changes in their business strategies. Consider, for example, bank attitudes toward environmental and social issues. The accountability of the financial sector on environmental and social issues has gained importance as is highlighted by awkward revelations especially in the oil & gas, energy and fashion sector backfiring on the financing banks. Even though terms such as “environmental management” are now part of the management structure, the overall concept of sustainable banking is still not a reality. To illustrate the current status of sustainability modeling, we will draw a parallel with risk management during three stages of the life cycle: childhood, adolescence, and adulthood. Childhood is the first lifecycle stage. It is the stage of trying, failing, and learning. Within risk management, the signs of childhood were a landscape of risk indicators and a lack of specialized resources in the bank. To draw a parallel with sustainability, we see a similar variety of metrics and indices. However, the center of the debate was not only about multiple measures, but also different views of sustainability itself. For example, M.T. Brown and S. Ulgiati  describe their emergy sustainability index based mostly on thermodynamics, in contrast to D. Lempert and H. N. Nguyen  who use the notion of culture and other anthropological variables to assess sustainability. These discrepancies on definitions, together with regional differences regarding commitment to measuring and reporting sustainability, make comparison across portfolios and between institutions almost impossible. During adolescence, the child grows rapidly, overestimates its strengths, and lives intensely – a similar behavior to risk management during the period between 1985 and 2007. It all started with the Basel I accord in 1988 which created a uniform (simplified) way of calculating minimal capital requirements based on the amount of assets at risk. Later, J.P. Morgan disclosed their RiskMetrcsTM method and, in 2003, Basel II followed, giving banks the opportunity to use internal models. Similarly, the Global Reporting Initiative (GRI) was introduced in 2000 to assess environmental impact from the activities of a company and report sustainability in a clear and standardized manner, making it easier to compare companies accordingly. The GRI also developed its own index based on the ecological footprint approach (W. Rees ). Nevertheless, the use of GRI standards was voluntary and therefore there were no formal requirements or pressure on companies to report on sustainability. As a result, there were no clear consequences for companies with high social and environmental impact and therefore no obligation to steer the business to improve such impact. The house rules were established, but no one was making sure they were being followed. Almost ten years after the great financial crisis, risk management has moved to the stage of adulthood. It has learned from its mistakes and is now mature enough to be able to tackle new challenges. Risk has acquired a position in the management of the bank with the function of chief risk officer (CRO). Regulations regarding measuring and reporting sustainability have also become tighter. Since 2014, large multinational corporations have been obliged by the European Commission to provide non-financial reports, including reports on environmental and social matters in addition to descriptions of business models, outcomes, and risks of their policies on sustainability. In 2014, the GRI G4 was introduced as a more materiality-based guideline. One of the key content improvements was the supply-chain impacts, which assess impacts across a company’s whole supply chain. In parallel, the carbon dioxide equivalent (CO2e) was introduced, providing a common methodology which puts all greenhouse gas (GHG) emissions in relation to carbon dioxide, so that all GHG emissions can be reported as a single, combined quantity, making it is easier to compare emissions between different companies across different industries. 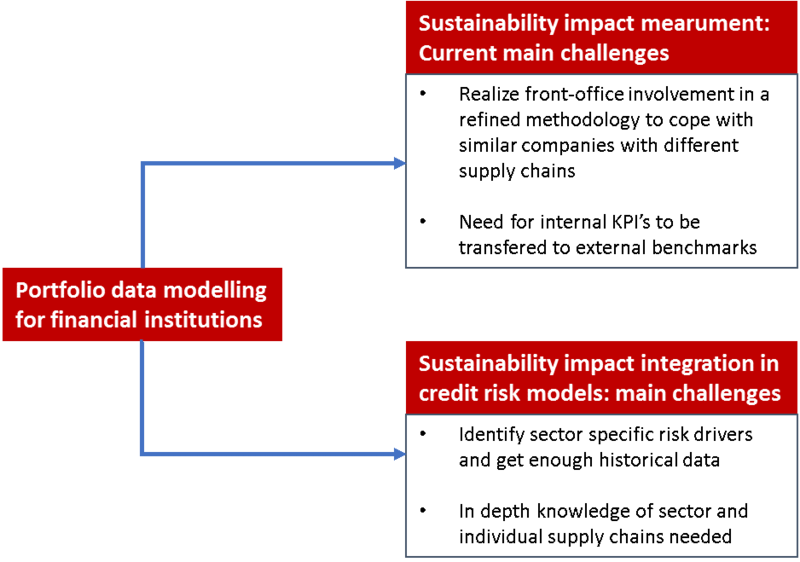 Through these developments, modelling and reporting sustainability performance have become regular activities for banks. Methodologies, such as scorecards, are a best-practice example to assess sustainability both internally and externally. In this way, banks have integrated sustainability impact in their models and sustainability measures in their reporting. Embodied energy (emergy) is the sum of all the energy required to produce any goods or services, considered as if that energy were incorporated or “embodied” in the product itself. Lempert, D; Nguyen, H. Nh; A sustainable development indicator for NGOs and international organizations. International Journal of Sustainable Society; 2008. The footprint approach measures the quantity of nature needed to support a society or an economy. As of 2017, 63% of the largest 100 companies (N100), and 75% of the Global Fortune 250 (G250) reported applying the GRI reporting framework (“Global Reporting Initiative – Facts and Figures.” Global Reporting Initiative. Q1 2018). So, what can Capgemini Invent bring towards the future of sustainable banking? Capgemini can help banks use financial instruments, such as FX swaps, to allow sustainable development in their own “sustainable” dealings – that is, integrating sustainability measures in the credit risk assessment process by building their credit and investment models on sustainability ratios instead of exclusively financial ratios, and ranking banks on their sustainability impact and reporting on the degree of sustainability of their loan portfolios. Banks must work together and look not only to improve internal processes but also integrate environmental costs into the price system in general. Finally, we as a society should demand more sustainable banking. Growing awareness among consumers will help steer business models towards a more “green finance,” where profitability no longer means more money but rather higher return rates on sustainability. To learn more or discuss sustainable finance, connect with me on social media. …but do your consumers pay lip service, or do they put their money where their mouth is? The next steps to deliver transformational change in the UK power industry.